‘Two friends. Oskar and Eli. Eli and Oskar. Eli loves twelve-year-old Oskar, even though he is an outsider. Oskar loves two-hundred-year-old Eli, even though she smells of congealed blood. But as Oskar learns the nature of his friend’s secret, the bodies have already begun to accumulate in the forest. People are starting to ask questions – to connect the evidence to an ethereal little girl living on the estate. This is supposedly a horror novel written by the Swedish novelist John Ajvide Lindqvist; translated to English by Ebba Segerberg. The book was also adapted as a film in both English and Swedish and considering the story telling acumen of the Scandinavians (I have watched a lot of TV drama); I picked up thing book without any hesitation. Coming to the plot, the book features a twelve year old boy from Blackberg, Stockholm; Oskar Eriksson, who is constantly bullied at school and fantasises becoming a serial killer without leaving a trace, starting with killing his bullies. He lives with his mother and yes, Oskar is downright arrogant and rude to her. The next is the other side of a plot, where a creepy paedophilic old man (Hakan Bengtsson) goes killing young boys for Eli, a vampire disguised as a girl; who lives with him. Eli happens to be Oskar’s neighbour and the two become friends. There are certain other sub-plots, such as the angle of Oskar’s friend Tommy and a group of drunkards. The positives I could say about the book are a very few; I felt the start was very good, and the two pager of a prologue was excellent in drawing your attention into the book and then going on about the atmosphere of terror caused by the ritual killer getting Oskar’s mother worried for his safety. I was highly engaged by book for the first 200 pages and the only positive aspect of the latter part was the positive influence Eli had an on the timid, cowardly Oskar, who started standing up for himself. But then, the author squandered the excellent start that he had built. For starters, I didn’t know the need for so many sub-plots in the novel just for the sake of some very loose and indirect connection towards the very end, especially that of the drunkard friends, Gosta, Virginia, Lacke, Larry and Jocke. 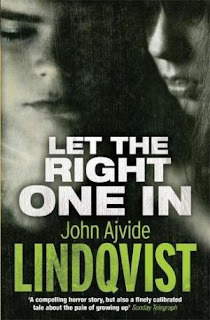 The next is that the book had no characters that the reader could like, Oskar is highly creepy, Eli seems to be a pathological liar, there are bullies all over the place, paedophiles at the other end, binge drinkers and law breakers and I am positive that Sweden is much more than that. The pace of the novel significantly reduced after the halfway mark where the focus shifted to the romance between Eli and Oskar rather completely ignoring the aspects brought about by the first 250 pages. Additionally, this supposed horror novel neither induced any fear nor any sort of horror. I felt that at the end of the plot, it was filled with loose ends and certain aspects of the story which he never had to bring in for the story that he has finally narrated, which could have been completed in around 200 pages had he chosen. This seems to be a book where the author has planned a very intricate plot and instead, the outcome is something totally different from what was planned. I don’t know how much of the novel was lost in translation but considering whatever was put through, I am not willing to give the novel its benefit of doubt. Based on the already aforementioned points, I would award the book a two on ten.